Good knives don’t have to cost a fortune. 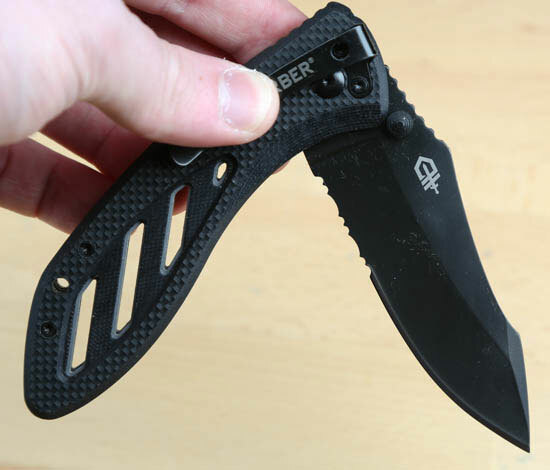 Gerber’s Instant folding knife, an assisted opener, is the latest to prove this. 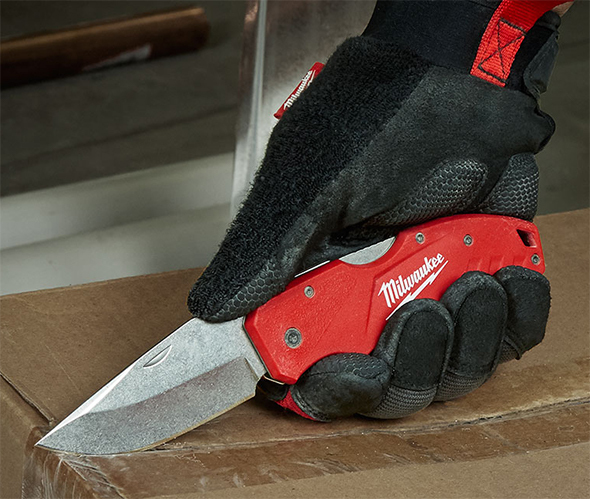 The Instant features a laminated G-10 handle, smooth assisted-opening mechanism, and one-handed closure. 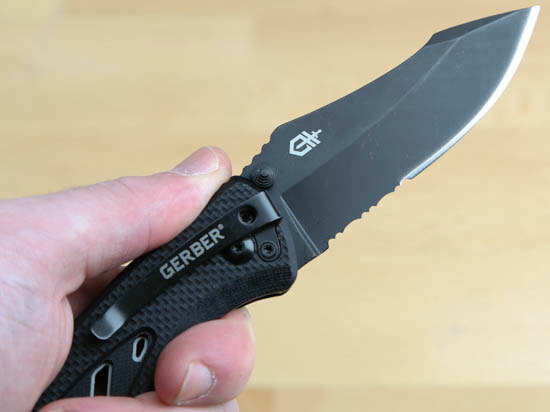 Gerber deliberately designed the Instant to have a tactically-inspired look. If you’re looking for a great quality assisted-opening knife with a more elegant everyday look, check out my review of the Kershaw Leek. The Instant is priced at slightly under $40 via Amazon and $40 via BladeHQ. The Instant has a 3.33″ partially-serrated clip point blade made from 7Cr17MoV steel, a mid-range composition that seems comparable to 440A. This gives the blade exceptionally good corrosion resistance and good edge retention. Some knife enthusiasts are vehemently opposed to partially serrated knives, but I don’t mind them, as long as there is a good balance between plain edge and serrated portions, as with the Instant. The clip point improves the knife’s piercing performance, but it also adds to the knife’s character and tactically-inspired look. There are thumb studs on both sides of the blade, and the jimping, while not aggressive, subtly carries over from the spine to the handle and improves the knife’s overall grip. 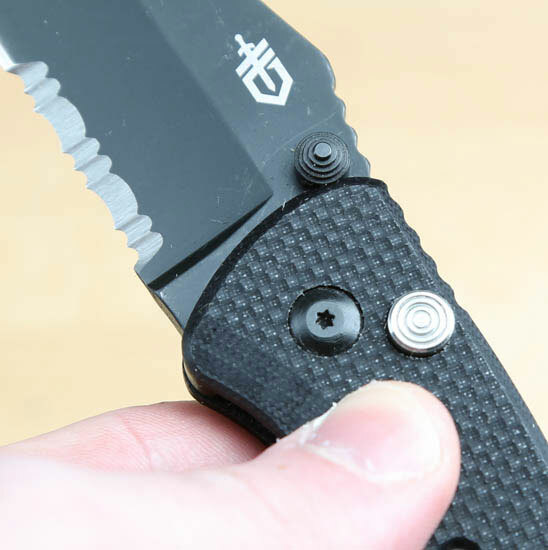 With the knife cradled in your palm, the blade deploys with a gentle push of the short thumb stud. I typically prefer assisted-opening knives that deploy via a flipper, because such designs keep my thumb clear of the moving blade, but the Instant gives me no reason for pause or hesitation. To me the Instant’s assisted-opening mechanism feels perfectly safe, something that cannot be said for all of the assisted-openers I’ve tested. The locking mechanism is simple, but effective. Once the blade is fully opened, a spring-loaded plunger pops into place, locking into a detent in the bottom of the blade. 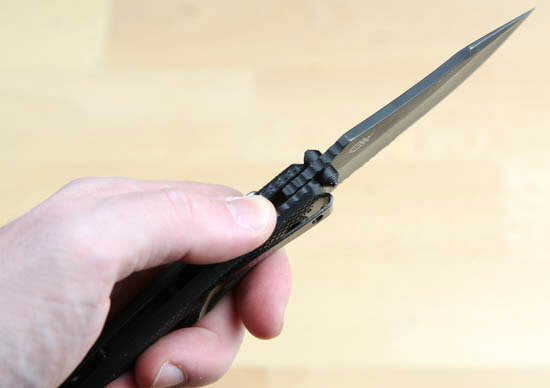 Gerber describes the locking mechanism as a thumb plunge lock, for how it disengages. The silver button only pops out when the blade is fully deployed, otherwise it sits flush against the knife’s handle. The Instant can actually be closed with one hand. This means that you can hold something to be cut with one hand, use the knife, and slit it back into your pocket or pouch without interruption. Although the knife looks designed for righties, lefties can also open and close the knife single-handedly. 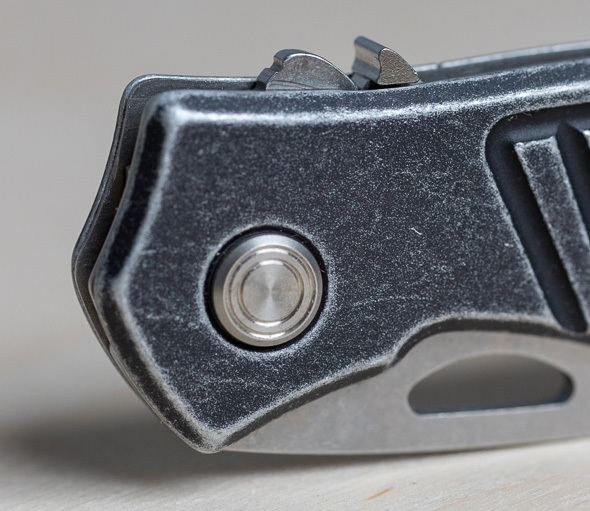 The Instant has a layered G-10 handle design that looks as good as it feels. Not everyone loves G-10 handles, but I usually do. It provides a secure and comfortable grip, even with sweaty hands. Both sides of the handle have steel inner liners, presumably for greater strength and rigidity, but they also add a bit of contrast and dimension to its looks. 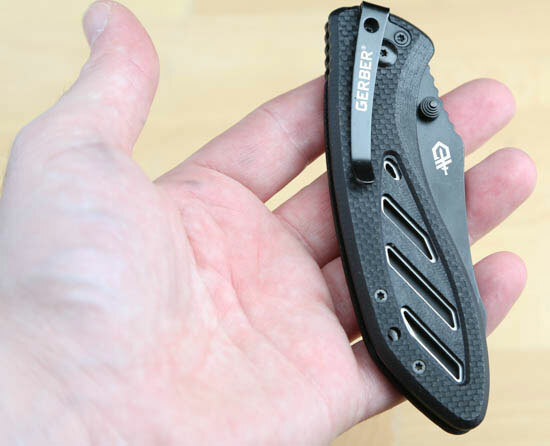 Gerber describes their Instant knife as an ultra-light ultra-tactile knife, and I have to agree. It is also a smooth-action assisted-opening folding knife that closes almost as quickly. There are no downsides to the knife as far as I can tell, at least in regard to design or build-quality. I found the small design considerations quite pleasing as well, such as the contour of the blade’s spine and the deep-carry pocket clip. The flat and thin (but not skinny) handle profile is another plus for which my pockets and thighs are grateful. Although the Instant has not (yet?) earned a spot among my favorite folding knives, it is a great assisted-opening knife, one I can highly recommend. Assisted-opening knives are not considered to be switchblades or automatic knives. It is recommended that you familiarize yourself with your local knife laws before purchasing or carrying a pocket knife. Thank you to Gerber for providing the review sample unconditionally. Review samples are typically given away, donated, or retained for benchmark and comparison purposes. If a police officer determines that the “assisted-opening knife” is a switchblade, possession in NY is a crminal act. NYC has strict knife laws, an unfortunate situation sometimes made worse by misinformed LEOs. I wouldn’t carry anything but a manual folder there, something like a Swiss Army Knife that takes two hands to open. A semi-related question – how about a small fixed blade? I’m really partial to my Bark River but would rather not have any problems. How small? The ESEE Candiru is a nice minimalist design, although I would recommend handle scales over a paracord wrap. I have not tried Bark River yet, but they’re on my list for the next series of reviews. There’s also the Izula, and if you want larger than that there are plenty of good options. The Bravo Necker (in 3V steel) has been my daily choice since I got it (between 6 months and a year ago). Both the Little Creek and Little Carver are great small pocket knives as well (the handles are really 3 finger size on those two). Bark River knives tend to turn into an addiction with all the different handle choices, styles and sizes….. It seems that maybe the first batch last Spring was defective, rather than there being a design issue. After reading about the recall I opened the knife several dozen times one morning with a 100% lock engagement rate. Whatever the problem was, it has since been fixed. I own this knife and it has been a disappointment. The shape is good, it’s easy to handle, and never slips, the edge retention is so so. 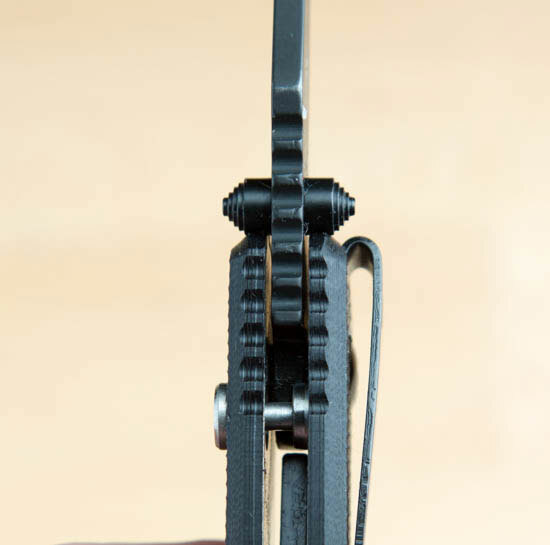 Within a couple of months the spring broke which eliminates the assisted opening and makes the blade dangerous, because it’s not longer hold in place when closed. Then the standoffs shear at the middle, because they are hourglass shaped and drilled through, the amount of metal at the middle is paper thin. Please stay away of this piece of crap.